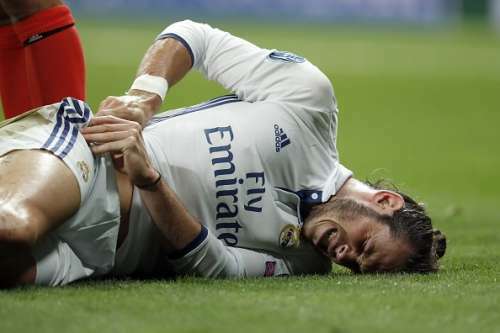 Gareth Bale will most likely miss Real Madrid's La Liga clash against Espanyol on Sunday after injuring his hip in Los Blancos’ 2-1 win over Sporting Lisbon in the opening game of the Champions League. Bale was recklessly challenged by former Liverpool defender Sebastian Coates and after the heavy challenge, it took a few minutes for the Welshman to get to his feet. Bale was not in the best shape in the second half and Madrid manager Zinedine Zidane replaced him with Lucas Vazquez. When the former Tottenham man was substituted, Real Madrid were trailing by 1-0 and looked to be heading for the first home defeat in the competition for five years. But Cristiano Ronaldo and Alvaro Morata struck in the closing minutes to seal a win which made sure that Madrid started their Champions League defence on a winning note. After being substituted, Bale was seen on the bench with an ice bag and looked to be in real pain. Raphael Varane confirmed following the conclusion of the game that Bale was limping but the injury is not serious. However, according to Marca, Bale underwent a medical examination at Madrid's Valdebebas training ground on Thursday to determine the extent of the problem. The results of the test are yet to be revealed but it's likely that he will miss Real Madrid's trip to Catalonia on Sunday. The club have said in an official statement that Gareth Bale trained using the indoor facilities in a session which saw Zidane call up Real Madrid Castilla players Enzo and Odegaard. The Welsh ace has been in good form scoring twice in six games so for this season. His injury will force Zidane to make a change to his starting line-up, with James Rodriguez or Lucas Vasquez in contention to take his place in the team. James Rodriguez, with his curling delivery from the left which picked Morata and ensured a stoppage time winner against Sporting Lisbon, may be a frontrunner for the starting line-up. With Ronaldo just returning from a knee injury, it will be interesting to see whether the in-form Bale’s absence, could halt Real Madrid’s perfect start to the season and set a club record of 16 consecutive domestic victories.